In case you don’t have the time to read over the entire 900-page document we recommend a few visual aids that can help you understand some of the report’s major findings and what their implications will be for life as we know it. To see how the U.N. projects temperatures could change over your lifetime, check out The Guardian’s interactive graphic, which allows you to input your birthday and see how much the planet has already warmed over your lifetime and how much hotter it will get. According to The Guardian’s analysis, if the world continues along with business as usual, a child born today would see rise of 2.7 – 6.3 degrees Celsius in his or her lifetime. To put that in perspective, 4 degrees was enough to take the planet out of the last ice age. Because of the long time span and the detail of The Guardian’s graph, you can also see how temperature fluctuations have varied over time while exhibiting a clear general upward trend. This is especially important given the reactions of many climate skeptics to the lull in temperature increases over the last 15 years. As the graph shows, however, there’s no reason to believe this lull will continue if we continue business as usual. The Guardian graphic also shows us that even if we make strong emissions cuts, global warming will continue to increase for a while. This is because the carbon we emit today stays in the atmosphere for quite some time after it’s emitted. This time delay in emission reduction policies makes it that much more necessary to take action right now. 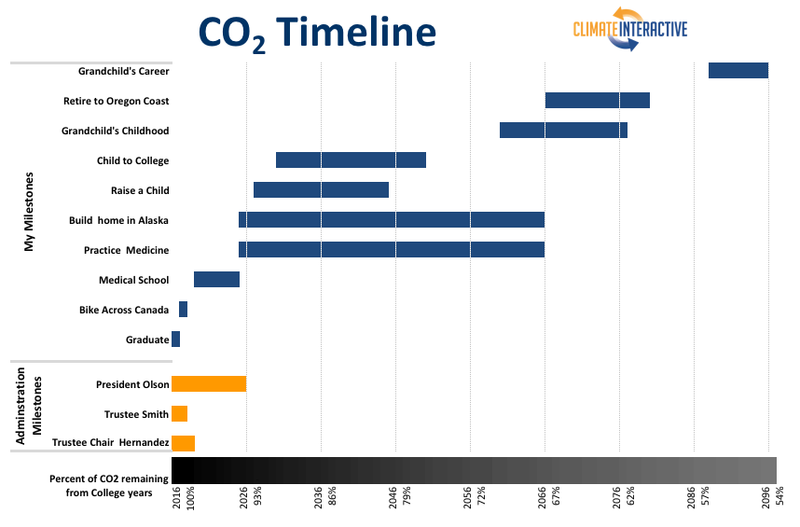 To get an idea of exactly how long this takes, take a look at our CO2 Timeline, which gives you an idea of how today’s emissions will affect conditions over the course of your life. By the time today’s college students are middle-aged, for example, 82% of the CO2 released during their education will still be in the atmosphere! Even worse, much of that remaining 18% will have been dissolved in the Earth’s oceans, increasing ocean pH and upsetting ocean food webs. Countries throughout the world have pledged to reduce their carbon emissions, but as we’ve said before, even if they all meet these pledges, the observed drop in carbon emissions wouldn’t be nearly be enough to avoid catastrophic consequences. The predicament seems overwhelming, but it is still possible to avoid this scenario. Investment in clean and efficient energies can be combined with emissions limits to meet energy demand and lower emissions. At the same time, forestation efforts can increase the carbon removed from the atmosphere. If you’re interested in seeing how policies like these can affect global warming, you can experiment with our C-ROADS simulator, which is available on our website. The U.N. is scheduled to give its policy suggestions of how to confront these challenges in 2014 — see if you can beat them to the punch!